The Art Eraser is an all round general use eraser that works well with all kinds of pencils. The Art Eraser is an all round general use eraser that works well with all kinds of pencils. 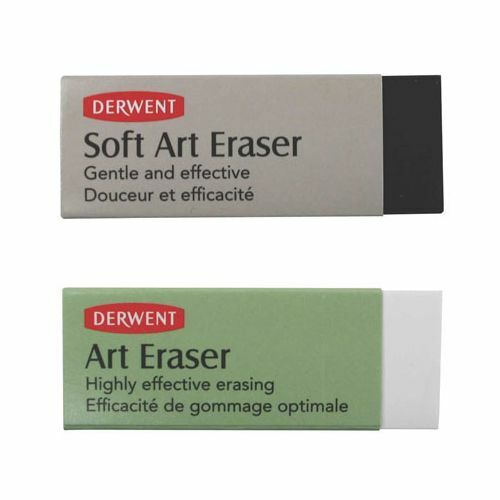 The Soft Art Eraser is as the name suggests and is softer than the Art Eraser. It contains charcoal for gentle and effective erasing, causing less damage to the paper. All books contain Hahnemuhle Top Quality 120gsm acid-free, woodfree white cartridge drawing paper. Thick Black covers with a faux leather finish. Portrait case bound on the longest side with strong sewn binding. Our strong and robust D&S sketchbook has a solid thread stitching making the turning of the pages smooth and easy. The paper has a fine non-slip surface which superb abrasion properties that enables you to effortlessly create broad wide lines and the natural wide shade gives a pleasing and charming tone to enhance the subtle shades of colour in your pencil drawing. Besides pencil work the book is ideal for use with watercolour pencils as well. Size: 9 x 12cm Contains 30 pages, 60 sheets. Recommended for ink and wash, pencil, charcoal, red chalk, fine liner pens, drawing ink and coloured pencils. This pad has natural white fine grain paper with its sturdy 140 g/m2 weight, and is perfect for designers, painters and graphic artists. The pencils are available in the following grades, 8H,7H,6H,5H,4H,3H,2H,H,HB,B,2B,3B,4B,5B,6B,7B,8B.